For medium businesses to large enterprises. tessello's feature set enables learners to capture, track and share their complete learning experience, powering the organisation to capture a wider range of learning patterns as well as the knowledge that exists in your employees through detailed reporting and analytics. 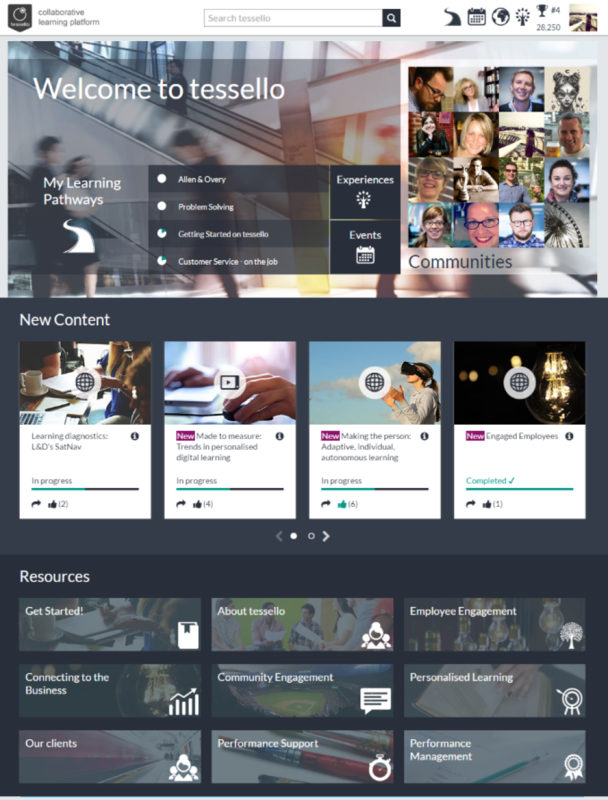 Robust, next-gen tools Personalised & exportable learning record Social & collaboration tools Coaching tools Wrapped up in a simple, intuitive and fully responsive interface to create a seamless user experience. Thanks for your comments Oliver, we really value your feedback. We have a lot of new functionality on our roadmap that we think you'll really enjoy¿we're really excited to be rolling these updates out to our customers over the coming year. With regards to the tiles and the daily digest¿we hear you loud and clear! We will be improving both these areas of tessello over the next couple of months. I'd love to discuss our upcoming plans with you in more detail, so I'll contact you directly to arrange a call. - always given strong support from Brightwave, especially during workshops that we hold twice a year. Thank you for your feedback! I'm very pleased to hear that you've received strong support from the team. The 2016 roadmap contains some big improvements to the resource tile layout, so I hope these will address some - if not all - of your requirements. Great experience using Tessello - just a few refinements needed on the management centre. Comments: Tessello is easy to use front end - as a learner and sharer. It looks stylish, and is a great service that we can make it bespoke to our business needs and branding. A mobile optimized site would be a great benefit, as we don't have access to the app. The Brightwave Management system however I find a little complicated and clunky. There could be some improvements - for example having clear sight of when a resource was uploaded, and being able to delete old/out of date resources completely to avoid having to search through endless files to find the one you're looking for. Thanks so much for your feedback. We are working on creating a fully responsive site during 2016. I'll add your comment regarding resource deletion to our Product Feedback Catalogue. Thank you for your review! We have a tessello app which can be download from Apple or Google Play store. It's designed for capturing experiences while on-the-go. We'd be happy to discuss your particular reporting needs. I'll ask Steph Bright, our Customer Success Manager to get in contact. Comments: Tessello has been a great solution for our company onboarding requirements. We were looking for a stand alone system for global new joiners to gather information about the company pre-joining in a fun, fast way and Tessello offered all this and more. Tessello is incredibly user friendly and interactive for users yet flexible and fast to upload and maintain for our Admin users. The only con we have come across is the post launch IS support. The team can be very slow in their response to queries which has marred the overall excellent experience to date. Comments: Pros - Tiles make it easy to find areas of interest from front page. Cons - None I can think of.